Collecting prayers and hymns is a part of many spiritual traditions. On occassion of Gandhi Jayanti we look back at some of the influences on Gandhi and the prayers which made him weave communities. If we do not want the English in India we must pay the price. Tolstoy indicates it. ‘Do not resist evil, but also do not yourselves participate in evil–in the violent deeds of the administration of the law courts, the collection of taxes and, what is more important, of the soldiers, and no one in the world will enslave you’, passionately declares the sage of Yasnaya Polyana. Reflecting on the above words and the doctrine of “Non-Resistance to Evil” which brings Soul-Force into history, we tried to apply the aspect of non-participation in violent systems. Health care delivery systems are shaped by insurance, pharma giants, technology companies, regulators. These impact the way providers give service. In some/many ways we are all enslaved if one has to participate in this delivery system which spreads transnationally. The discussion went to the links of major technology and pharma suppliers to regimes and how real-estate controls medical professionals. How violent is our system? “I still hold the view that I cannot conceive politics as divorced from religion. Indeed, religion should pervade every one of our actions. Here religion does not mean sectarianism. It means a belief in ordered moral government of the universe. It is not less real because it is unseen. This religion transcends Hinduism, Islam, Christianity, etc. It does not supersede them. It harmonizes them and gives them reality” (Harijan, February 10, 1940). The above words left me wondering. How many of the “children” of the Father of the Indian Nation Gandhi yet believe this? And if they believe it, how easy is it to follow? never allows conceit to enter his mind. on Gandhi-ji. Gave him some of these quotes/prayers as food for thought. “The test of orderliness in a country is not the number of millionaires it owns, but the absence of starvation among its masses” (Muir Central College Economics Society, Allahabad, December 22, 1916). We will continue our discussions..and walks. Chapter -6-The Honey Comb comes apart. 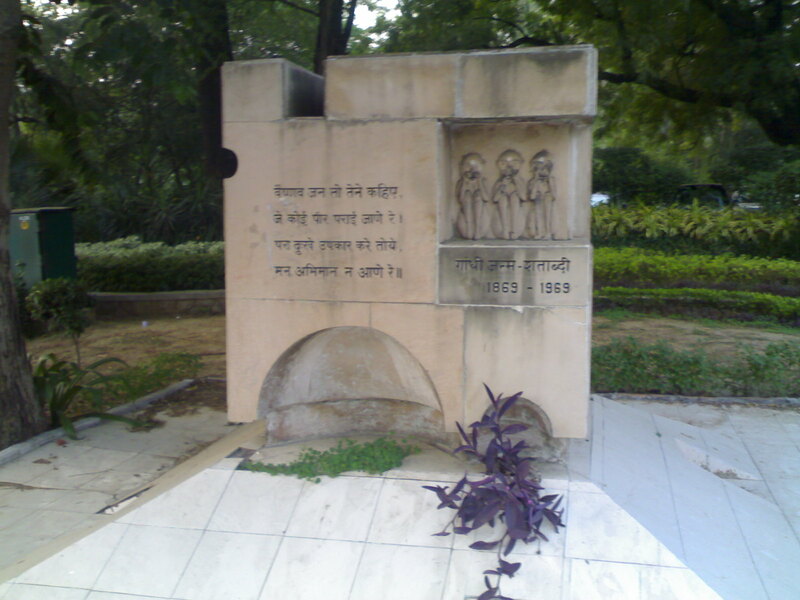 This entry was posted in Everyday History, Health Policy, Learning, life and tagged Gandhi Jayanti, India, Indian Diaspora, life, Lodhi Gardens, Narsinh Mehta Prayer, Politics, Taraknath Das, Tolstoy, Tripoli Reading Group. Bookmark the permalink. Remembering Gandhi – ji, and reading the contours of the struggles in South Africa, where he first started.his.civil disobedience, through the work of Nadine Gardimer.